Dan Ariely, behavioral economist and the New York Times bestselling author of The Upside of Irrationality and Predictably Irrational, examines the contradictory forces that drive us to cheat and keep us honest, in this groundbreaking look at the way we behave. The extremes of dishonesty, personified by the notorious white-collar crimes of wrong-doers such as Ponzi scheme architect Bernie Madoff or Enron’s Jeff Skilling, are well-known. 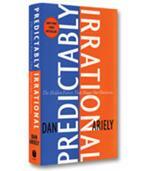 However, through years of experiments designed with different motivations and rewards, Duke University professor of psychology Dan Ariely and his research partners prove again and again that, if given the chance, just about everybody will cheat. Why this propensity for cheating? 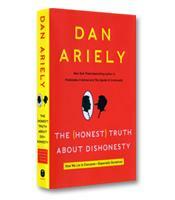 In The (Honest) Truth About Dishonesty, Ariely attempts to answer this vexing question. His surprising discovery? There doesn’t seem to be any rational motivation to cheat. The results of the matrix task, one of Ariely’s standard dishonesty experiments, exemplifies the extent of typical cheating by seemingly honest people. In a set of boxes, Ariely puts 12 numbers, such as 1.69, 1.82, 2.91, 4.67, 4.81, 3.05, 5.82, 5.06, 4.28, 6.36, 5.18 and 4.57. Two of the numbers add up to 10. For the experiment, Ariely gives participants a paper with 20 such matrices. The goal is to find those two numbers in each matrix. Participants are given only five minutes to complete the task and receive 50 cents for each correct matrix. One group of participants turn their papers in directly to the examiner. Another group is told to shred their papers first and then report their results to the examiner. The opportunity for cheating for this second group is obvious. The results showed that those who could not cheat consistently solved an average of four of the 20 matrices. Those who could cheat reported that they solved an average of six out of 20 matrices. Traditional theories of dishonesty link cheating and crime to basically a cost-benefit analysis: the extent of the crime depends on a rational assessment of the potential reward, potential risk, and opportunity. Adjusting the matrix experiment, Ariely proved that the rational motivations for cheating don’t explain why people cheat (for example, people cheated the same whether they received 50 cents or $5 for each correct answer). If reward, risk and opportunity aren’t the reasons we cheat, then what is the cause? 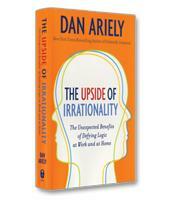 This question is the core purpose of the book, and the answers Ariely reveals through his many creative experiments and tests are varied and sometimes surprising. For example, we are more likely to cheat when we are tired. Perhaps one of the most important findings is that cheating is the slipperiest of slopes. Even the innocuous "cheating" of wearing knock-offs — fakes of expensive clothing and accessories — makes us more likely to cheat in other areas of our lives. 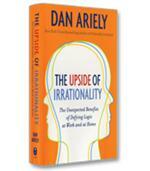 As a result, Ariely writes, "We should not view a single act of dishonesty as just one petty act. ... The first act of dishonesty might be particularly important in shaping the way a person looks at himself and his actions from that point on — and because of that, the first dishonest act is the most important one to prevent." This fascinating book on the psychology of dishonesty can be disheartening, yet at the same time offers hope for a world with less "fudging." The first step is to recognize the problem, which is perhaps the most important contribution of The (Honest) Truth About Dishonesty.